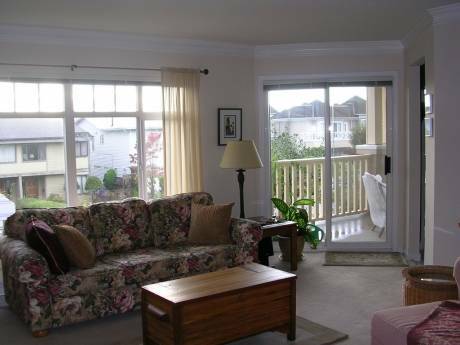 Our 2-bedroom, 2-bathroom home is located between 3 waterfront parks and yet just a 7-minute walk to the town centre. It's a very quiet area of manicured lawns and lovingly tended home gardens. The fenced back yard is a tranquil setting for an alfresco dinner after a busy day of touring and is well furnished with lawn swing, hammock, table & chairs. Both spacious bedrooms-- one is ensuite with a queen bed and the other has a king bed and bay window and is next door to the main bathroom -- overlook the leafy, private back yard. The fully equipped kitchen, including dishwasher and microwave/toaster (all new appliances) enjoys a view to the street and the attractive homes opposite. Our computer centre is also in the kitchen. The laundry room with stacked washer-dryer and sink is adjacent. The livingroom also looks to the street and features a natural gas fireplace. The bedrooms have electric baseboard heaters with individual temperature controls. The home was totally renovated, including all new windows and wood laminate floors, in early 2007. Under Joyce's watchful and particular eye, the renovations also included an all-new main bathroom, crown mouldings in all but one room, kitchen subway tiles and dining nook overlooking the newly landscaped front garden. Overall, the cottage is decorated with an arts and crafts flair (kudos to Glasgow's Rennie Macintosh) and is admirably suited for up to four adults. Patrick, 75, is a retired newspaper writer and broadcaster, while Joyce, who is several years younger, is retired from operating a B & B. We are second time arounders (eight years) and between us have five adult children and nine grandchildren, none of which we bring on exchanges, we rush to add. We have enjoyed 9 exchanges to Europe in the past 5 years (England, Scotland, Ireland, Spain and Denmark) and look forward to many more. We respond to all inquiries and are open to simultaneous exchanges with persons offering their primary residences. While on exchange, we prefer using public transit rather than driving ourselves. We are open to any time of year other than July and August when family comnmitments require us to remain at home. Comox is a lovely seaside village on the central part of Vancouver Island -- it's a 25-minute flight to Comox from Vancouver International Airport. Vancouver Island is world-renowned for its spectacular beauty and outdoor activities which range from whale-watching, to surfing on the open Pacific, to skiing gorgeous Mount Washington (a half-hour drive from our home). 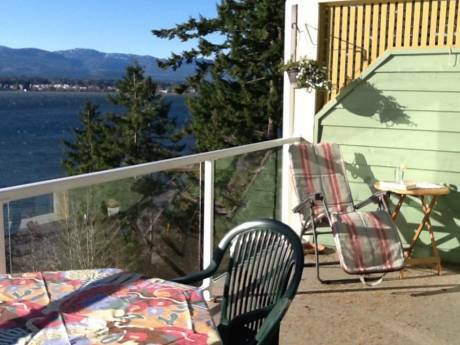 Comox is about a 3-hour drive to the City of Victoria which features spectacular Butchart's Gardens and the marvellous Royal British Columbia Museum as well as theatres and fine dining. Our home, as well as being handy to shopping, dining and pubbing, is within a 10-minute stroll to the colourful marina that accommodates commercial fishing boats as well as yachts and smaller pleasure craft. Within short walks are lovely parks in which deer abound. On a typical morning walk you will observe deer, pheasants, harbour seals, bald eagles, Canada geese and innumerable shorebirds as well as many friendly human faces. The local public airport, a 10-minute drive, provides quick access to Vancouver International Airport, a half-hour flight from Comox. There are direct flights from Comox to Vancouver, Calgary, Edmonton and Mexico and, in the planning stage, to Europe. Local public buses provide service to the adjacent towns of Courtenay and Cumberland and a regular bus service runs from the nearby Comox Mall to downtown Vancouver or the Vancouver International Airport via the Nanaimo-Horshoe Bay car ferry.